They’re Coming to Take Me Away, Ha-Haaa! 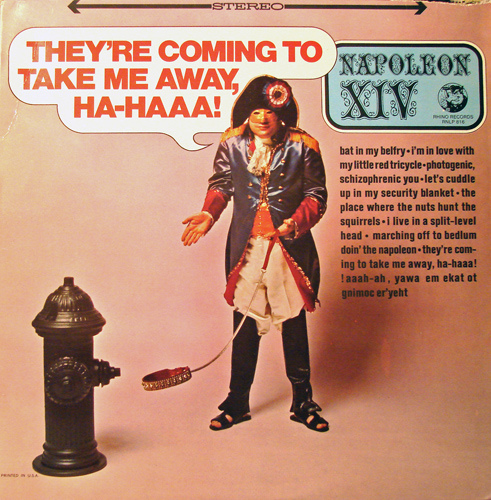 from Napoleon XIV was banned from airplay in the US. The recording is a first-person rant by a seemingly mentally ill patient who is bemoaning the loss of either a wife, lover, or dog who ran away. Napoleon XIV is Jerry Samuels, a recording engineer from New York. He himself never performed the song, it was always other people who did the live act. The July 30, 1966 issue of Billboard magazine contains an interesting bit about the uproar this song caused. An interesting fact about this “song” is because there were no musical notes or melody, the record could not be copyrighted as a song. Instead, though, it was copyrighted as a lecture intended for oral delivery. This still means other record companies couldn’t copy it without permission. Following the original record’s success, Jerry Samuels wrote and recorded a sequel to it in 1990, “They’re Coming To Get Me Again, Ha-Haaa!